It turns out that it is rather simple and easy to make einkorn sourdough bread, especially after you gain more experience. For a long time before I tried it, I imagined it is a complicated and laborious process. I asked around, inquired how it’s done, read numerous articles on the matter and one day I decided to give it a try. Now it takes me about 10-12 minutes. I will share my simple experience of a non-professional in the kitchen for those of you interested in this topic. First you need to make the sourdough: On the first day mix 35 g of freshly ground wholegrain einkorn flour and 50 ml of spring water in a glass container. Stir well with a wooden spoon. Leave the mixture at room temperature (I place it some place high, as the air is warmer). The consistency of the mixture becomes thick. On the second day add 35 more grams of flour and 50 ml of spring water, and stir well. On the third day throw away half of the mixture and add a new 35 g of flour and 50 ml of water. On the fourth day if the sourdough is not ready yet, repeat the steps from the third day. Keep doing that until the sourdough is ready, which means that bubbles appear in the mixture, and you can also feel a strong, very sour smell. Usually the sourdough is ready by the sixth or seventh day, and in the summer it is possible that it is already active on the second day. The sourdough should not be stirred between the adding of flour and water. If the sourdough is ‘fed’ more often (two or three times per day), it becomes ready quicker. With the aforementioned proportions you should have about 170 grams of sourdough. And here is the bread recipe: Ground 500 g of einkorn, add 170 g of sourdough (einkorn), salt to taste, 310 ml of spring water and a pinch of something sweet – honey or brown sugar (I use xylitol). Use your hands to mix the ingredients well for 2-3 minutes without pressing too hard, until all the flour is absorbed by the mixture. The dough becomes quite sticky. Put it in a non-stick baking tray, shape it and smoothen the surface. It is good to puncture the dough with a wet knife or a fork, in order for it to breathe. You can draw something, if you wish. Finally, sprinkle with flour on top. The baking tray I use for this amount of dough is round, with a diameter of 20 cm. If you would like to make a different size of bread, keep the proportion of 35 g of sourdough per 100 g of flour. Place a cloth over the dough and let it rise for 7-8 hours at room temperature. Afterwards put it in the oven and bake for two hours at 140 degrees. If you like your bread with a crispy crust, leave it in the oven for 10-15 more minutes. 1. How to preserve sourdough? 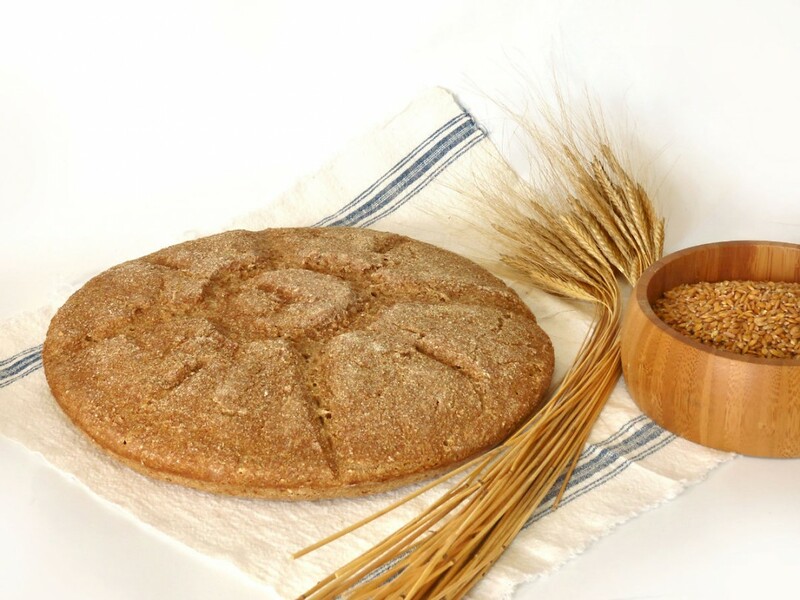 Different sources advise to dry sourdough in order to preserve it and activate it with warm water when you need it. I tried that, but the process was very slow. 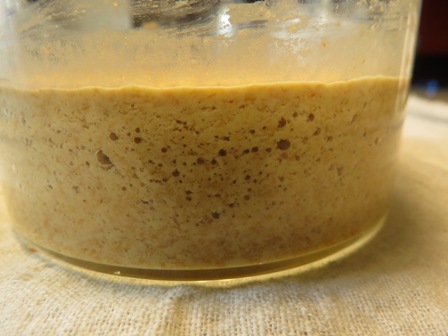 I recommend the following approach: After using the sourdough, pour 100 ml of spring water in the glass container that you used to keep it (if you wish to make a different size of bread you should consider the amount of water to put in the container). Stir the water inside the container well, seal it and put it away in the fridge, without throwing out the water. The container can last up to 3-4 days. When you decide to make bread, take the container out and put only 70 g of freshly ground einkorn flour in it (if you want a different size, you should calculate the amount of flour according to the aforementioned proportion). The sourdough will be ready in 10-12 hours. I will give an example of how I implemented all this in my everyday life. In the morning I take the glass container out of the fridge, I shake it well so that there is no residue and I add 70 grams of flour. In the evening the sourdough is ready and I mix the dough for the bread before I go to bed. I let it rise during the night and in the morning when I wake up I put it in the oven to bake. You can arrange a timetable according to your own schedule. 2. What flour should you use? 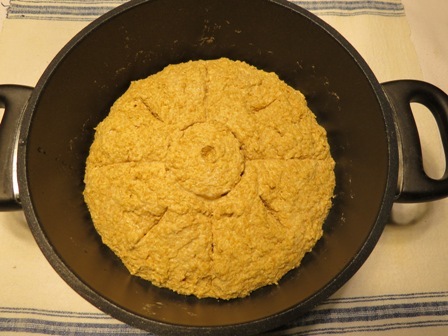 It is best to make your own flour and grind the einkorn at home. If you don’t have a flour mill, you could grind the flour in a shop/bakery, that offers the service (there are such places in Bulgaria), or you could buy wholegrain einkorn flour (it is best if it is ground in a stone mill). 3. I don’t knead the dough for too long, because I learned that the less gluten there is present in the flour, the less kneading is needed (gluten inside einkorn grains is almost nonexistent). If you are making bread from another type of flour the method of kneading would be different. I don’t have such experience. 4. After placing and shaping the dough inside the baking tray, sprinkle flour on top. 5. It is better to bake the bread in a nonstick pan, so that you don’t need to use any type of oil. 6. Prior to baking sprinkle the dough with water. This way its surface softens and it rises better. 7. The time and temperature of baking can be adjusted according to your own knowledge and experience. I tried to bake the bread for two hours at 140 degrees, when I learned that is the way that healthier bread is baked in Germany. It works well. 8. After the baking let the bread cool down (5-6 hours) on a grid without covering it with anything. While the bread is still warm the process of baking continues inside of it. It is best to break the bread when it has cooled off completely. 9. The bread is best preserved in a paper bag, when it is completely cold. Perhaps the explanations above seem a little complicated, however in reality when one gains experience and spends the necessary time and attention, it is quite simple and easy. For the preparation of one bread, from the grinding of the flour, through the kneading of the dough, to the sourdough preparation, are needed 10-12 minutes. Don’t give up if your first few attempts are not entirely successful. 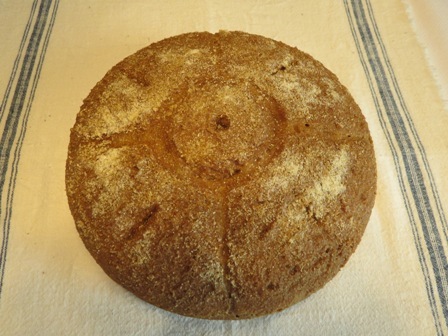 With desire and perseverance anyone can make einkorn sourdough bread. If I succeeded you can, too.